A Good-Natured Riot is an extremely well written history of one of the longest running radio shows of all time, the Grand Ole Opry. 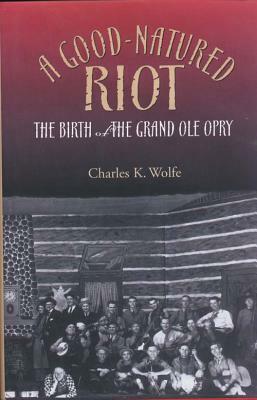 Charles K. Wolfe provides us with an astounding amount of research into the first 15 years of the Opry's existence, yet his attention to detail and facts never gets in the way of his writing or story telling. I especially appreciated the fact that Wolfe goes into the backgrounds and careers of several important and not-so important early Opry members, that due to a lack of recordings have almost been completely discounted by the country music industry. It's unfortunate that there were no recordings of the Opry in these years, but thankfully with Wolfe's writing and the few recording we have it's evident what the Opry must have sounded like. I've been very disappointed by the lack of attention to the history of the Opry that I've seen on the internet, where it seems there's almost no way to view the Grand Ole Opry movie from 1940 or hear any of the early recordings that are out there. This is no complaint of the book though, just a frustration dealing with the topic. After reading this book I have gained a much deeper level of knowledge and understanding of early radio, Nashville, pre-war country music, and of course the Opry. It's amazing to realize how little I knew about the Opry's origins and early incarnations. I have a grounding in country music of the late 20s, but mostly from the Carter Family and Jimmie Rodgers. And I know more about country music of the mid-to-late 40s. This book covers 1925-1940, from Dr. Bate (who I've never heard) and Uncle Dave Macon (who I've barely heard) to the Delmore Brothers to Roy Acuff and Bill Monroe. It's fascinating to think how all this music, which preserved and developed old traditions and modernized them into something new, was made, heard by thousands of people across the U.S., and then vanished. There were very few recordings of those old shows, and, in fact, a fairly small number of professional releases of records by the acts on the Opry itself. Wolfe does a fabulous job of combining interviews with surviving members or their offspring with contemporary newspaper accounts, creating a thoroughly enjoyable, if partially unknowable, narrative of the players, the producers, and even some of the listeners.